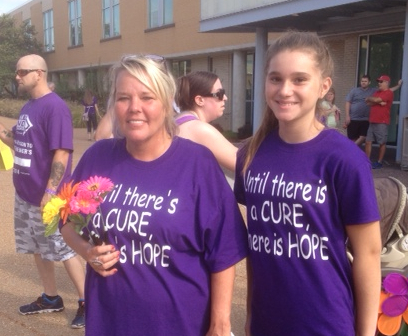 A large crowd was on hand Saturday, September 27, at St. Charles Community College in Cottleville for the St. Charles Walk to End Alzheimer’s. 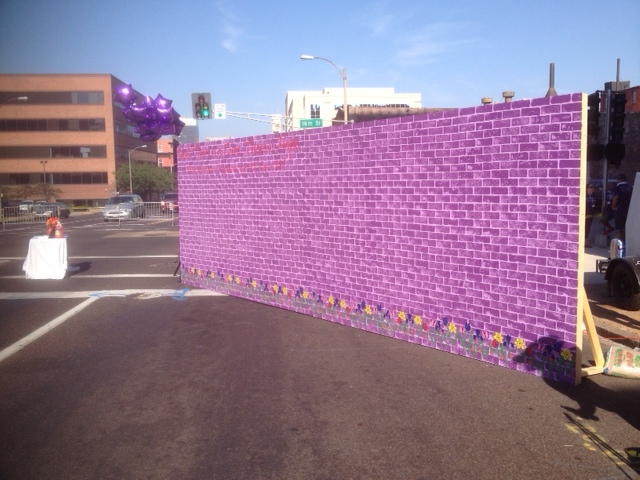 Hope Hospice brought our Memory Wall to allow walk participants to write a sentiment or share a thought about a family member or friend who has been affected by Alzheimer’s. 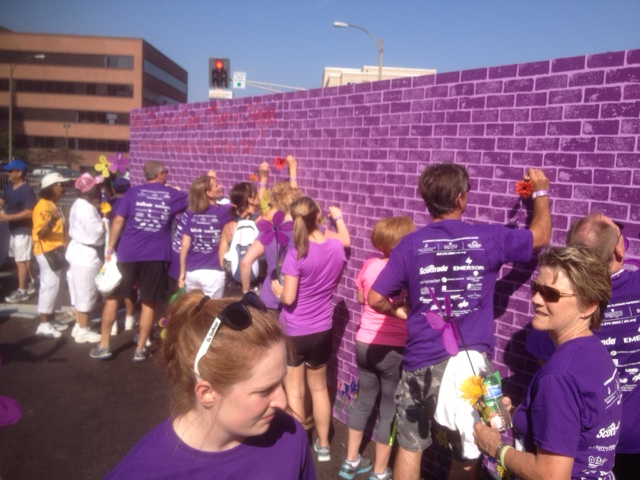 Many of the walk participants took a moment to sign the wall and most of the words they wrote touched our hearts. 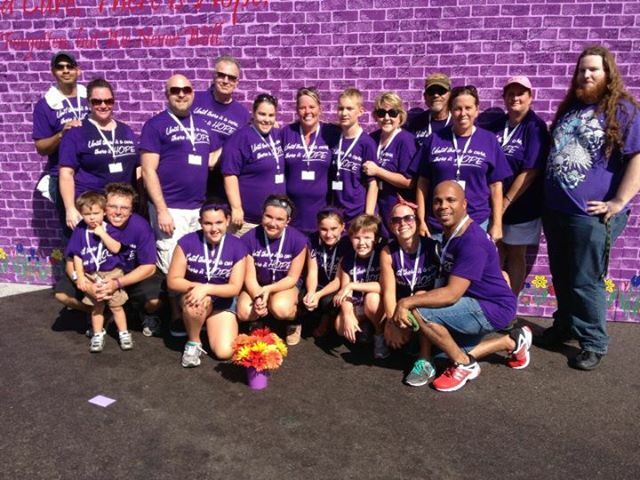 Several members of the Hope Hospice staff along with Hope Hospice volunteers greeted walk participants and made sure there were plenty of Sharpies for signing the wall. 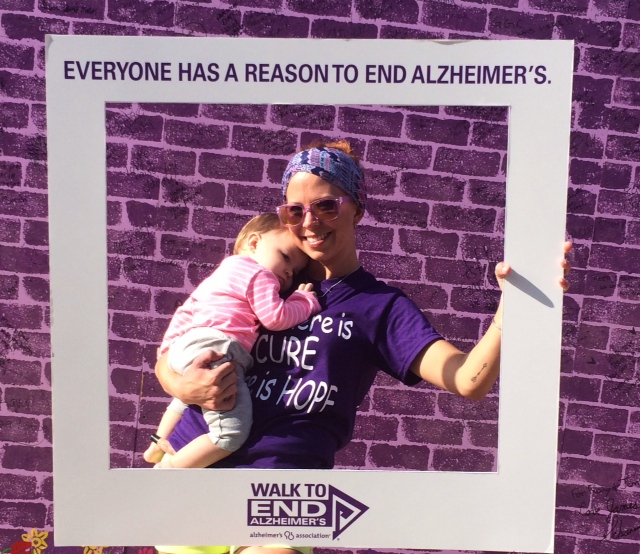 The Walk To End Alzheimer’s and all the work done by the Alzheimer’s Association calls attention to a condition that affects millions of Americans who have the disease as well as many more who serve as their caregivers. If you were not able to participate in the Walks in St. Charles or St. Louis, you can support the work of the Alzheimer’s Association by going to alz.org for information and donation opportunities. For information about hospice care in metro St. Louis, call Hope Hospice at 314-984-9800. We can talk to you about hospice care for Alzheimer’s patients, as well as other conditions. Special thanks to Curt Bilbrey who constructed the Memory Wall and set it up! For Americans age 65 and older, Alzheimer’s is the fifth leading cause of death. Because Alzheimer’s generally develops over a period of time, a patient with an early diagnosis of Alzheimer’s may not qualify for hospice care. But when a patient reaches the later stages of Alzheimer’s and a doctor determines that a patient has six months or less to live, hospice care can play an important role for patients and their families. Today’s Geriatric Medicine, in an article posted on its website, points out that “hospice is underutilized for advanced dementia patients.” The main reason? “End-of-life prognostication presents a significant barrier to hospice usage.” In other words, it may be harder for a doctor to make the “six months or less” assessment with an Alzheimer’s patient. In the book, she expresses distress that not only is there no cure for Alzheimer’s, there are no disease-modifying drugs or treatments. Research to find cures and treatments for Alzheimer’s is continuing. Some of the funding for that research is collected via events like the Walk To End Alzheimer’s, set for Saturday, September 27, at St. Charles Community College in St. Peters. The Hope Hospice team will participate. If you’d like to help, click HERE for more information. For questions about hospice care in metro St. Louis, call us at Hope Hospice at 314-984-9800. 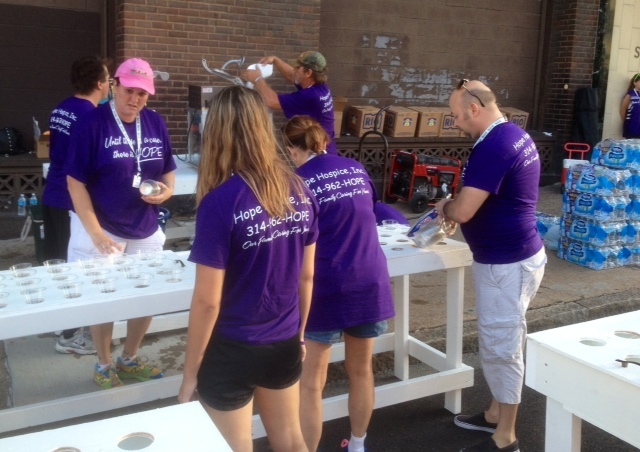 On Saturday, August 31, the Hope Hospice team arrived early in downtown St. Louis to honor and support the participants in the Walk to End Alzheimer’s. Hope Hospice community liaison Sarah Bilbrey designed and, with a huge assist from her father Curt, made the Memory Wall for walkers to sign. 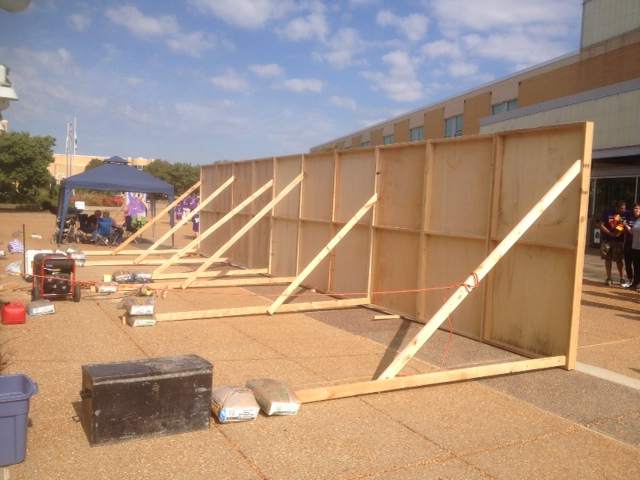 When the six sections of the wall were erected, it made an impressive sight. 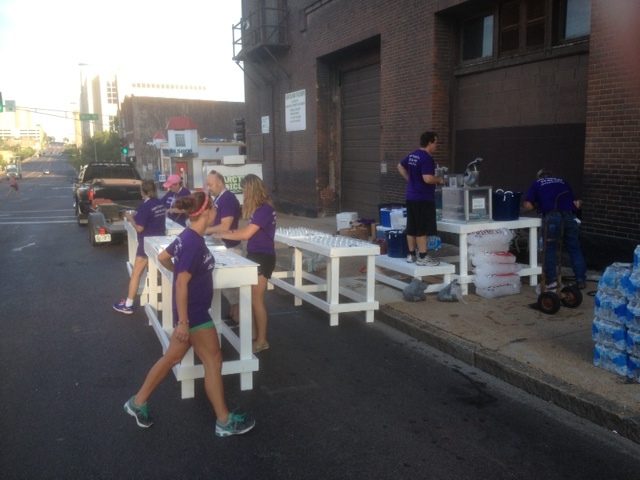 The Hope team of staff members and volunteers iced down hundreds of bottles of water to hand out on this hot morning. 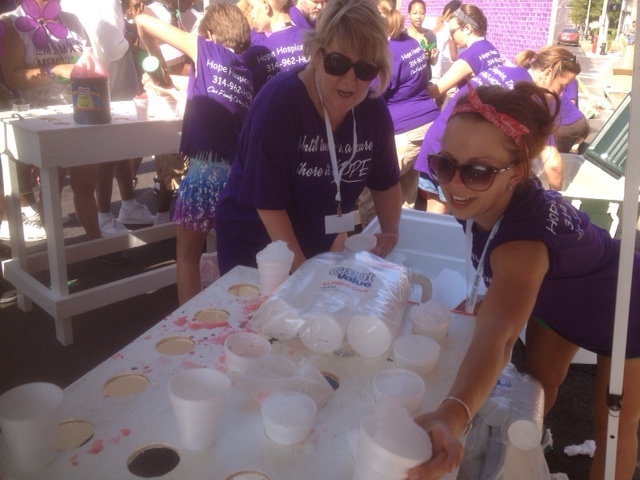 Several hundred pounds of ice were ground into sno-cone ice. Bottles filled with syrup to flavor the sno-cones were set up. The team was ready. A DJ played music that echoed around the intersection of 18th and Olive, near the White Knight diner. Barricades blocked the street of vehicular traffic. The Hope Hospice staging area was at the approximate halfway mark of the walk, which was to begin and end at Busch Stadium. The first walkers were expected to arrive around 9:20. But by 9:40, not one walker was to be seen. Had walk officials told people to opt for the shorter one-mile walk because of the heat? Had walkers chosen not to walk because of the heat? No, they just got a late start due to remarks before the walk began. Within a few minutes, here they came! An initial trickle, followed by a bigger group, then finally a large crush of walkers. They were happy to see the Hope team handing out bottled water. Walkers of all ages went for the sno-cones. 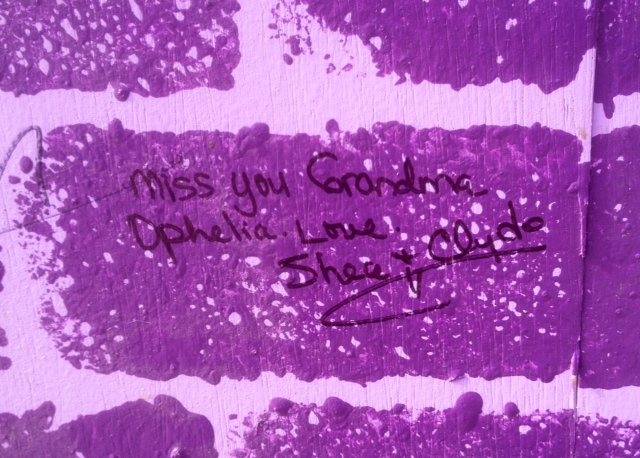 Most gratifying though, was the number of walkers who took a moment to sign the Memory Wall and share their thoughts about their family members and friends who have suffered from Alzheimer’s Disease. When Hope Hospice team members read some of the sentiments left behind, they were moved to tears. We at Hope Hospice thank the Alzheimer’s Association for the opportunity to participate. We also thank all those who walked and especially those who signed the Memory Wall. 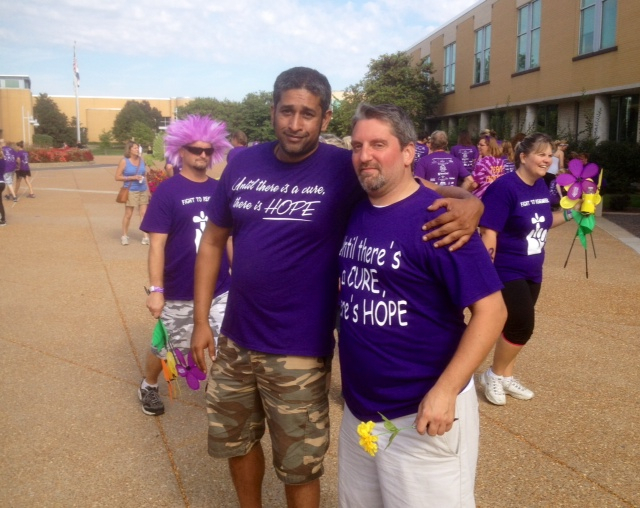 For information about Hope Hospice, please call 314-984-9800. Or visit HopeHospiceSTL.com. Alzheimer’s Disease has become more familiar to Americans in recent years, perhaps due to news of well-known Americans who have been affected by the disease. Alzheimer’s victims include Ronald Reagan, Rita Hayworth and Charlton Heston. Recently, singer Glen Campbell was diagnosed. Alzheimer’s is the most common form of dementia. It is a condition that gradually worsens. It generally affects those over the age of 65, but can also occur in younger adults. Memory loss is just part of Alzheimer’s. This disease of the brain eventually affects bodily functions and leads to death. 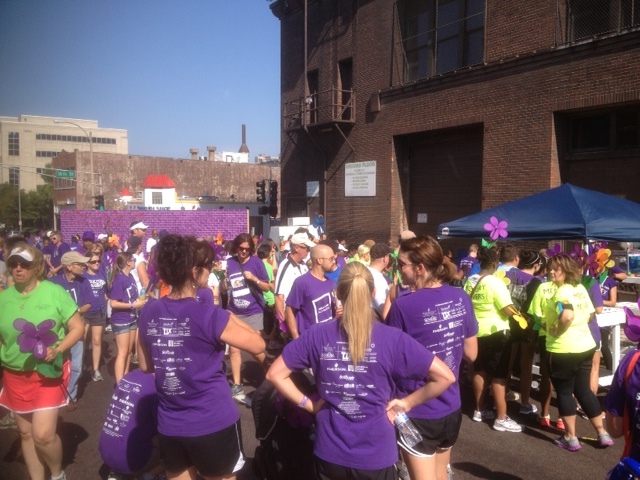 The St. Louis chapter of the Alzheimer’s Association is holding its 2013 Walk to End Alzheimer’s on Saturday, August 31, 8:00 a.m., starting at Busch Stadium. Hope Hospice will be a sponsor and an active participant in the Walk. Many of our staff and volunteers will be walking. 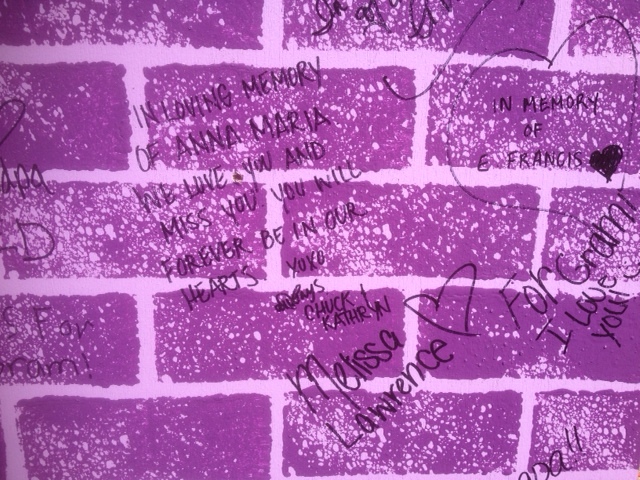 Some will be greeting walkers at our Memory Wall. You are invited to take a moment and sign the wall and write a short note about a person in whose memory you may be walking. 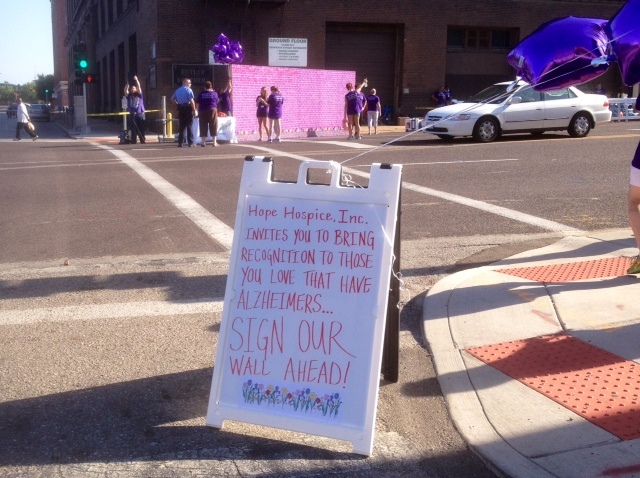 Look for our Memory Wall at 18th and Olive in St. Louis. Alzheimer’s research continues with the goal of finding more ways to treat the disease. Of course, the ultimate goal of this research is to discover a cure. The Alzheimer’s Association helps fund research. The group also provides information about Alzheimer’s for patients, families and medical personnel. Our team at Hope Hospice has benefitted from knowledge the group freely shares. 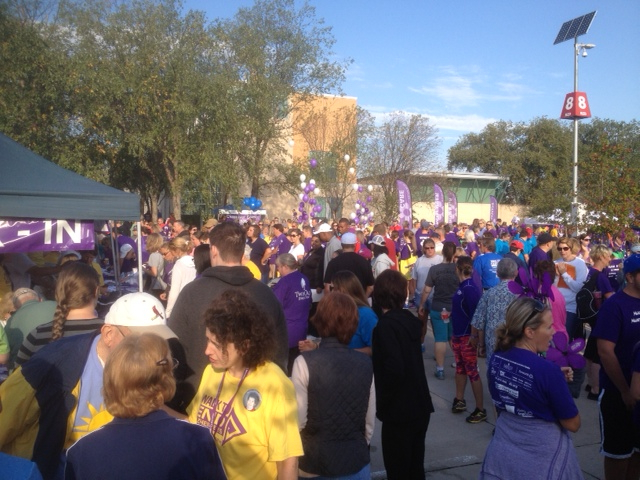 We encourage you to Walk to End Alzheimer’s this Saturday. Click HERE to sign up. You can start a team, join a team or walk as an individual. If you are unable to walk on Saturday, you can walk virtually. There is no fee to register for the walk but this is a fundraising event and your contribution will be appreciated.